A whimsical Christmas Log Cake with rich and bold flavours! The aromatic coffee syrup, layered with rich milk chocolate and completed with seasonal embellishments. 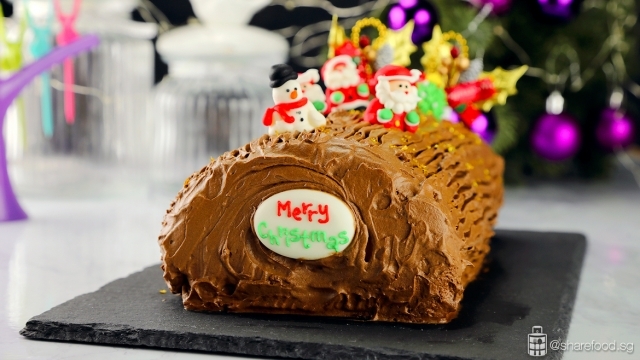 Christmas is never quite complete without the traditional festive log cake. This sumptuous Chocolate and Coffee Christmas Log Cake recipe is shared by Ryan Khang. A chef, culinary instructor, nutritionist, food writer, editor-in-chief and television presenter. 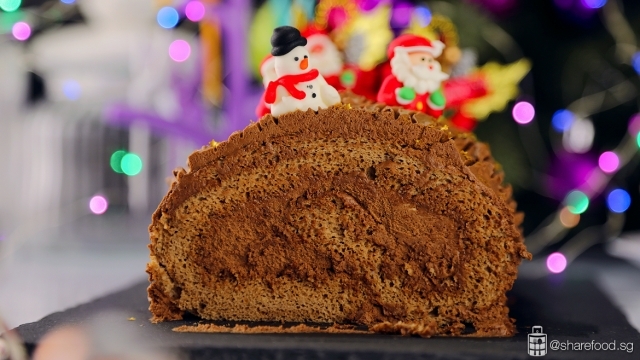 He shares his popular Christmas recipe, Chocolate and Coffee Christmas Log Cake. Celebrate Christmas in style! This would be a great way to mark the end of a sumptuous feast! First, we start the with the most essential part the sponge cake. In a pan, heat milk and cocoa powder till it's fully dissolved. Next, we prepare the egg mixture by placing egg yolk, whole egg, cooking oil, milk and cocoa powder in the Kenwood Chef XL Sense stand mixer. Attach on the K beater and mix well. Add in salt and flour, beat till all ingredients have fully combined. Attached the whisk and beat on high speed till it’s frothy. Add sugar and beat till it peaks. For the meringue, place egg white and cream of tar tar in the Kenwood stand mixer bowl and attach the whisk. Beat on high speed till its frothy and add sugar in 3 batches. Continue beating till its peak forms. Scoop 1/3 of the meringue into the mixture and fold in gently. Pour in the remaining meringue to the mixture and fold till just combined. Pour the batter into the lined baking tray and bake for 15 mins at 180°C. Simmer until a syrup-like consistency. 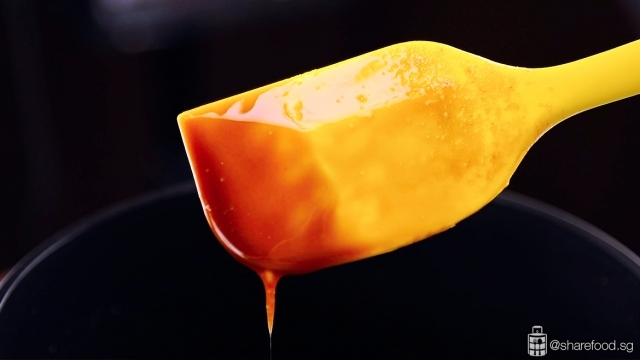 While the sponge cake is being baked, prepare the coffee syrup. Add all ingredients in a saucepan and stir to mix evenly. Bring the mixture to a boil. Next, lower the heat and allow it to simmer till a syrupy mixture has formed. When the cake has been baked, remove the cake from the tray and lay it on the tabletop. While it is still warm, roll the cake into a roulade and let it set in shape. Unroll, brush coffee syrup onto the cake and layer with chocolate frosting. Carefully roll the cake to form a tight roulade. Spread the remaining chocolate frosting over the cake and use a fork to draw long lines down its length to create a wooden, bark-like effect in traditional Christmas log cakes. A whimsical Christmas Log Cake with rich and bold flavours! Light chocolate sponge roll coupled with the taste of aromatic coffee and rich chocolate filling. Chocolate lovers would be delighted with this! Bring the Christmas cheer to gatherings with this irresistible Chocolate and Coffee Christmas Log Cake. The aromatic coffee syrup, layered with rich milk chocolate and completed with seasonal embellishments. 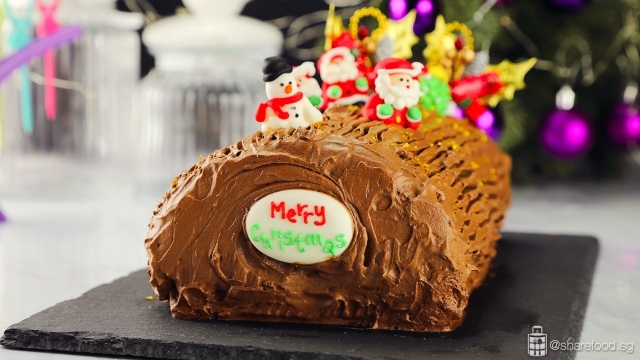 Christmas is never quite complete without the traditional festive log cake. 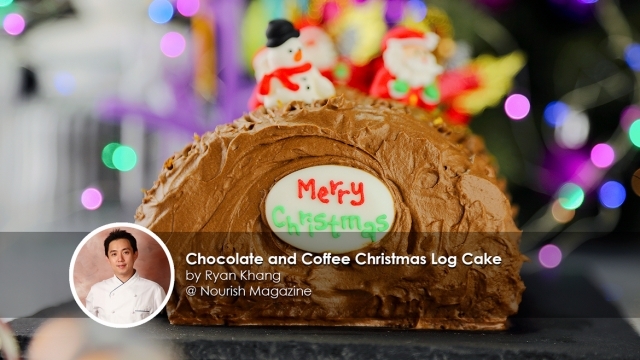 This sumptuous Chocolate and Coffee Christmas Log Cake recipe is shared by Ryan Khang. 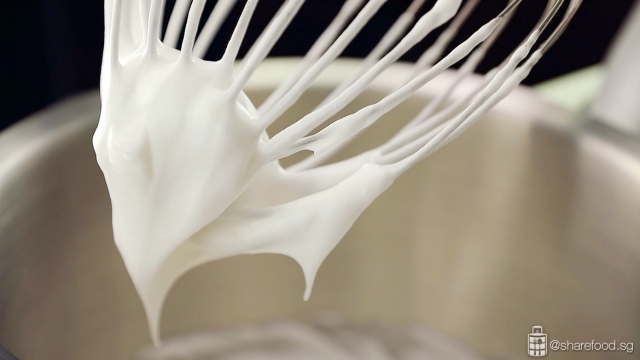 Prepare the meringue: In the stand mixer bowl, add in egg white and cream of tar tar. Attached the whisk and beat on high speed till it’s frothy. Add in sugar in 3 batches and continue to beat it till its peak foam. Decorate the top of the log as desired. For ours we decorated it with seasonal sugar figurines and sprinkled edible gold stars.